We were asked to share some exciting news with you today! 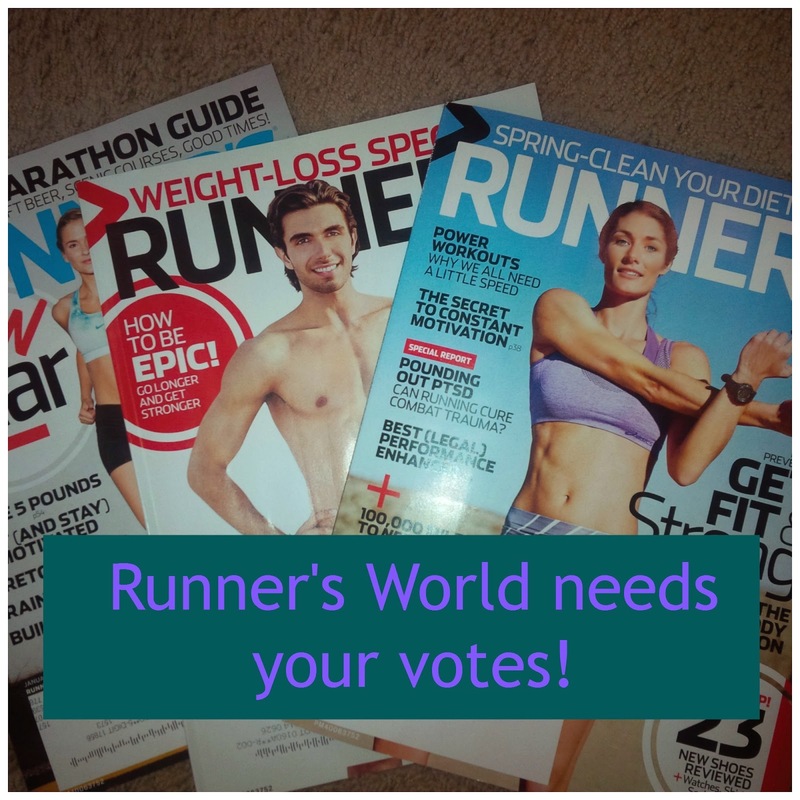 Runner’s World magazine has made the final round of the ASME Best Cover Contest Readers’ Choice Award! The cover that gets the most “likes” on Facebook wins. They were nominated for all three November Project covers. Here are the hyperlinks for each of the project covers. Please consider voting! You can actually vote for all of them. What are your thoughts on the covers that were nominated? The theme this week is about injuries and since I've had a lot of those lately, I'll share some of the stretches I've been doing. I seems to be getting better now so I am crossing my fingers I don't have any more injuries! The fitness activity that I have been doing lots of lately is stretching! 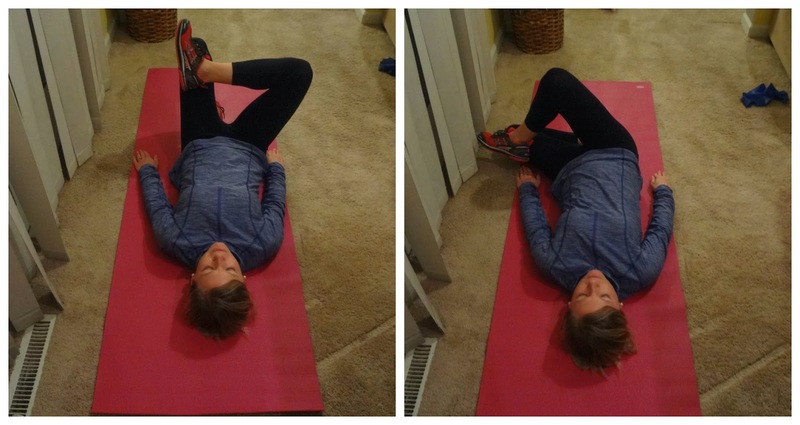 Since two of my favorite stretches ( Bridges and Clam Shells) were ones that were shared with me through another blog, I thought I would pay it forward and share some of the stretches that I have been doing in PT with you all in hopes that maybe it will help someone else. 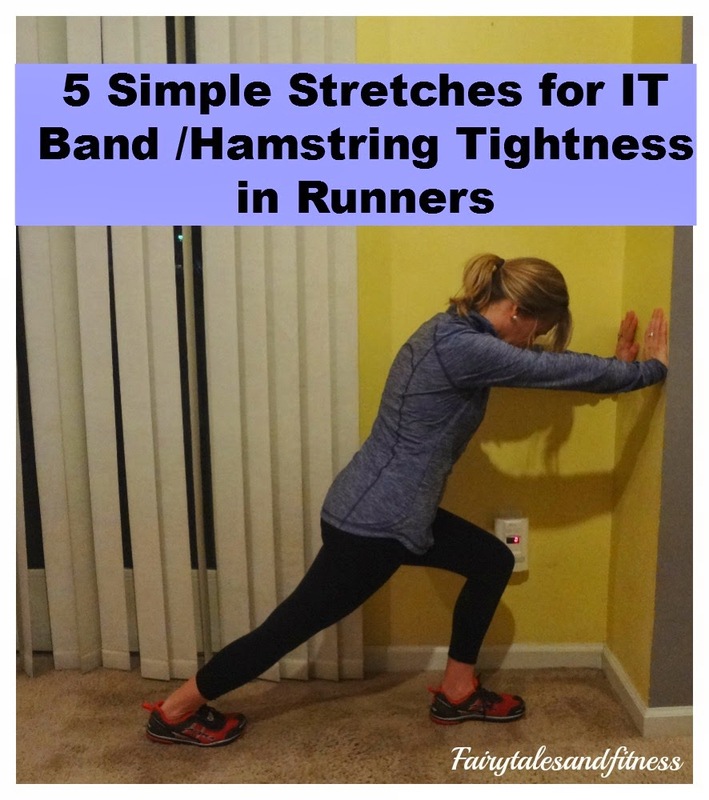 My sister and I put together this brief tutorial of 5 stretches to help with IT band pain. 1. 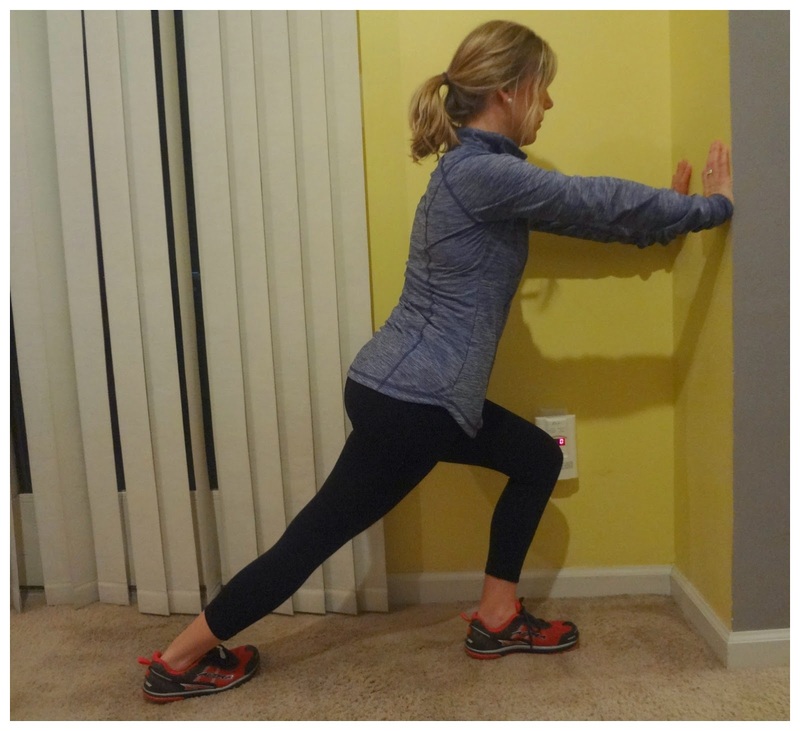 Calf Stretches: put hands on wall or other straight surface. Bend on leg while pushing back with the other. Make sure the foot on the leg you are pushing back with is slightly turned inward. You'll be able to feel the stretch more that way. Hold this stance for 10 seconds and then switch legs. 2. Seated Hamstring Stretch: You can't tell in this picture but I have 3 pound weights strapped to my ankles ( You can use which ever weight feels right to you). You'll want to sit on a hard surfaced chair. Put a pillow under the leg you will be stretching. Arch your back as you grip the underneath part of the chair ( this is very important in feeling the resistance as you stretch). Lift the leg up until your knee is straight and then for a bit more stretch, flex your toes up. Do this 10X with each leg. Don't forget to move the pillow under the leg you are stretching. 3. This one is called Power Position: This is all you do. Hold this position for 15 seconds and do 6 sets of them. The key here is to actually make sure your feet are pointing straight ahead while you do it. I am a slight pronator so you will notice that my right foot is slightly flared out. I'm working on this! 4. Single Leg Stand: Bend right leg. Extend left leg to back and lift off the ground. The key here is to not let the knee of your bent leg extend past your toes. Also the leg that is coming off the floor should stay straight. It should not cross behind you. Stick this position for 15 seconds. Then switch legs. Do this 4x. 5. 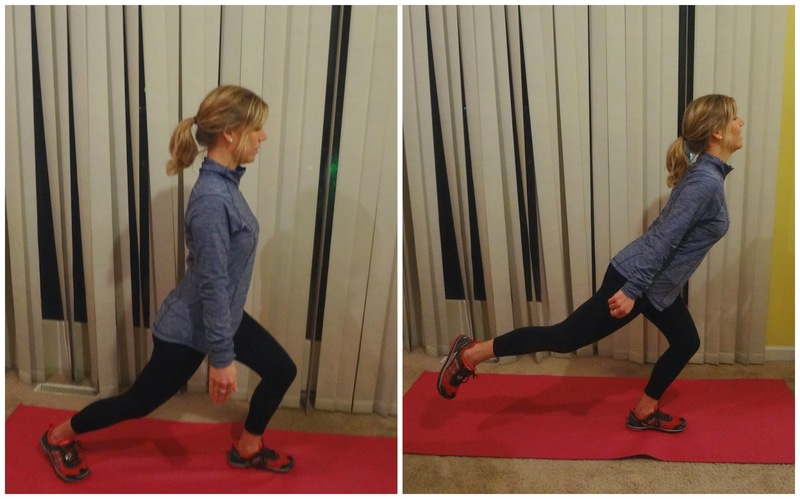 Cross Leg Rotation: Start in the position as pictured in the first picture. Keeping your foot on your knee and your shoulders still straight and on the floor, slowly rotate your leg until your right foot touches the floor ( picture 2). Hold this position for 10 seconds. Do this 10X with each leg. These are just a few of the stretches I have been doing for my pain. The key is to build strength in your upper legs as well. Hopefully those of you who are suffering from knee pain or tight hamstrings can try a few of these. Even if you are not in pain, it is a very good idea to add these to your running routine. Let me know if you've tried any of these stretches/exercises or if there are any that you do that you think I should add to my routine! 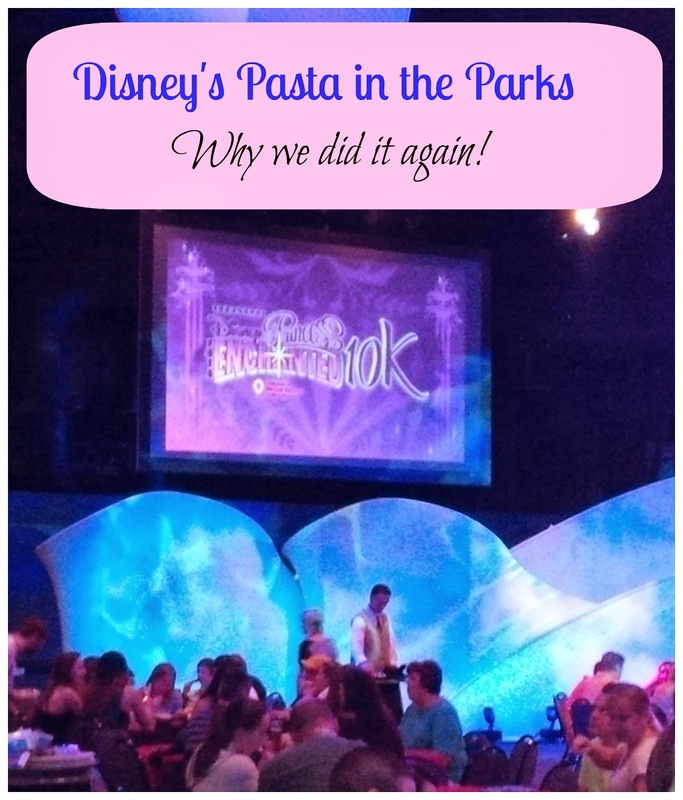 Our first experience with Disney's Pasta in the Parks Party was during Marathon weekend last year. Although we enjoyed our time there we didn't think it was necessarily something that we would need to do again. Just experiencing it once was sufficient and we were glad that we did it. 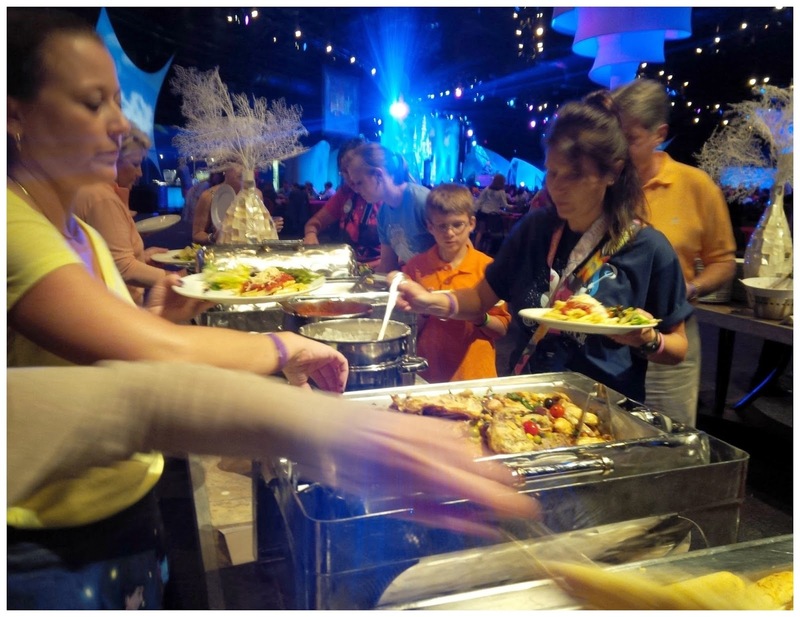 The Pasta in the Parks party includes, early admission to Epcot, a buffet dinner, dessert, character meet and greet, and a reserved seating location to view Illuminations. Last year we debated on whether or not we wanted to stay for the Illuminations show. Of course we wanted to get our monies worth out of the ticket price so we stayed, but boy were we exhausted by the time we got back to the resort and it didn't help that we had to be up at 2:30 am the next day. Fast Forward to Princess weekend 2014. We decided that we would go ahead and buy tickets for the party again. We did have fun last year and since our mom would be with us this time, we wanted her to be able to experience it once too! Since we were allowed in early we were able to play in the park a little bit. Last year we made our way over to Soarin but this year we didn't want to waste the good daylight hours waiting in line! So we used our time to visit some characters. We also had enough time to make our way over to Innoventions and get our free Character Picture done for being a Disney Visa Card holder. If you have a Disney Visa, don't forget to stop there for your free picture! This is on our must do list each time we visit! The rest of the time was spent looking for a tutu that I could wear for the 10K race the next day because I forgot mine at home. A bit goofy we know, but we figured this might be the only picture we would have from the pasta party because we remembered it being so dark in there last year that many pictures did not come out. We were just being prepared! 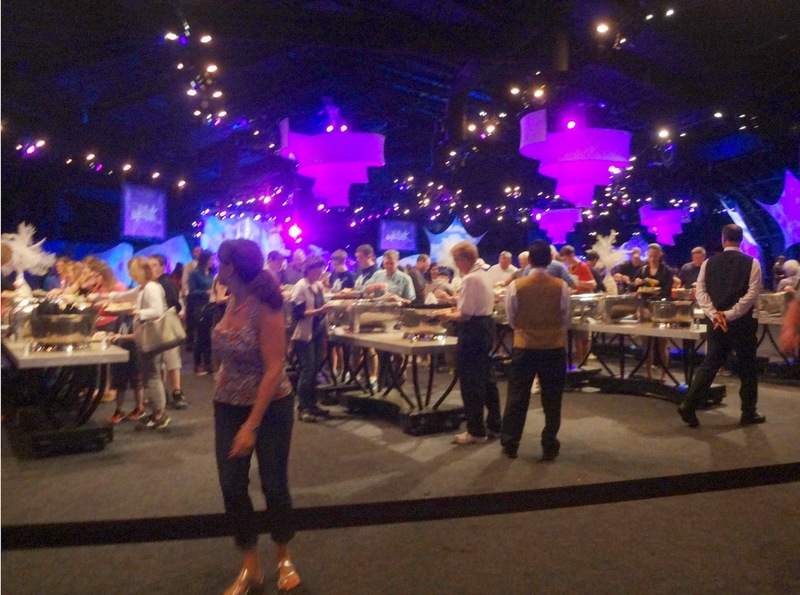 The pasta party is in a pavilion that is behind Canada in the World Showcase. it is usually blocked by a big door. I think we may have actually ran by this building during one of the races. We arrived just as they were letting people in but had we been the last ones there it wouldn't have mattered. There was so much food and I bet there was probably 50 buffet lines. Nobody had to wait to get food! Last year we didn't know about the character meet and greet at the party until it was too late. 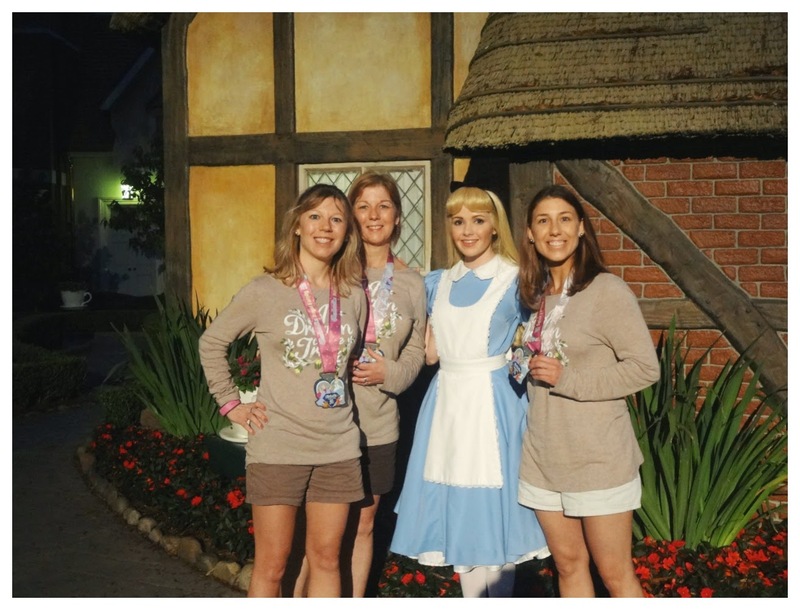 This year since we were already wearing our medals from the Cinderella 5K earlier that day we thought we would have some fun with Cinderella Characters! 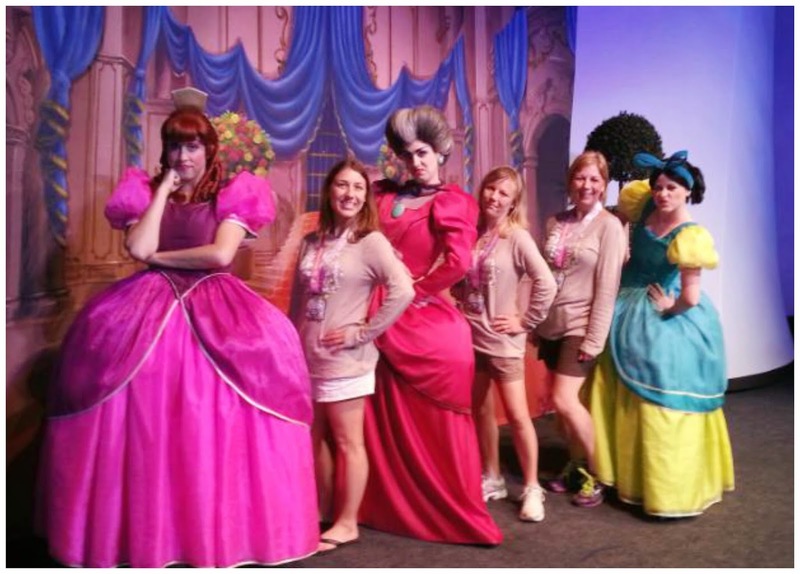 This is the very first time we've ever seen Cinderella's Step Sisters and Step mother! Our photographer told us to look serious so of course I gave my best Mckayla Maroney Smirk. Apparently my mom and sister didn't get the memo! We were actually surprised with how many characters were present and ones that you don't see too often. I think this would be a great place to bring kids because the character interaction was great and the meal was excellent too! They were doing dessert a bit differently this year. They were going to be serving it at the Illuminations viewing. I heard it was going to be a dessert buffet but I can not confirm that for sure. We had about an hour or so till Illuminations and we all agreed that we didn't want to stay. It was already too late of a night for us. We were happy with our Mickey Ice cream sandwiches and decided to call it a night. We did stop to visit with a few more characters on our way out of the park. We were so happy that we were staying at a resort along the monorail line. We got right on and off the monorail, walked to our resort, and headed for bed! So, the morale of this story is that Yes, the pasta party is a good time, but it does make for a long night! It is a shame that we didn't stay for the dessert ( I was curious to see what was going to be served) and Illuminations since it technically is included in the ticket price, but we knew we were just too tired to really enjoy it. 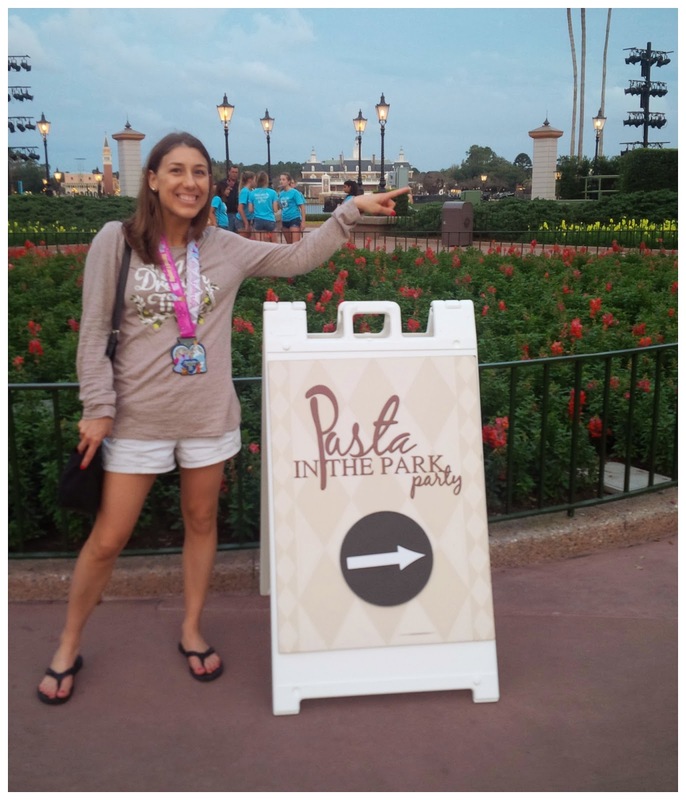 Have you ever been to a pasta in the parks party? Do you normally take advantage of the pasta parties at other races? 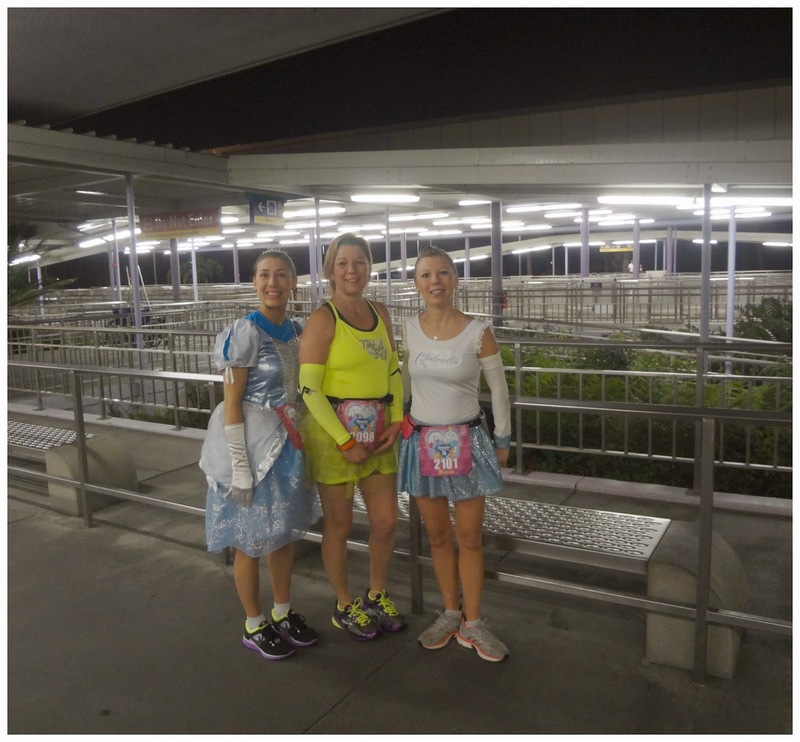 Do you normally cut your evenings short the night before a Disney race or do you stay till park close? Everyone has a different opinion on what makes a good running shoe and what works for one person may not necessarily work for another. Everyone's feet and needs are unique so that's why when some one says "These are the best shoes ever" or "These are SO comfortable" you really need to take that with a grain of salt so to speak. I am not here to tell you that these are the best shoes or that you should run right out and buy these, but I am going to tell you what I've learned about them to see if they might be the shoes ( or type of shoe) that would work for you or that you know not to waste your time trying them. These are the Altra Olympus. First thing I noticed is the Purple color. I love it and it immediately made me think of Grape Soda! The Olympus was made as a trail shoe ( hence the rugged bottom) but can be used for road running too. These are Max cushioning shoe AND they are the zero drop as well. That means the same amount of cushioning that is in the heel of the shoe is also in the forefront of the shoe. This results in the "stacked heel" look that you may not be use to. I know I wasn't use to it. These are considered a "neutral" shoe and has a contoured foot bed. 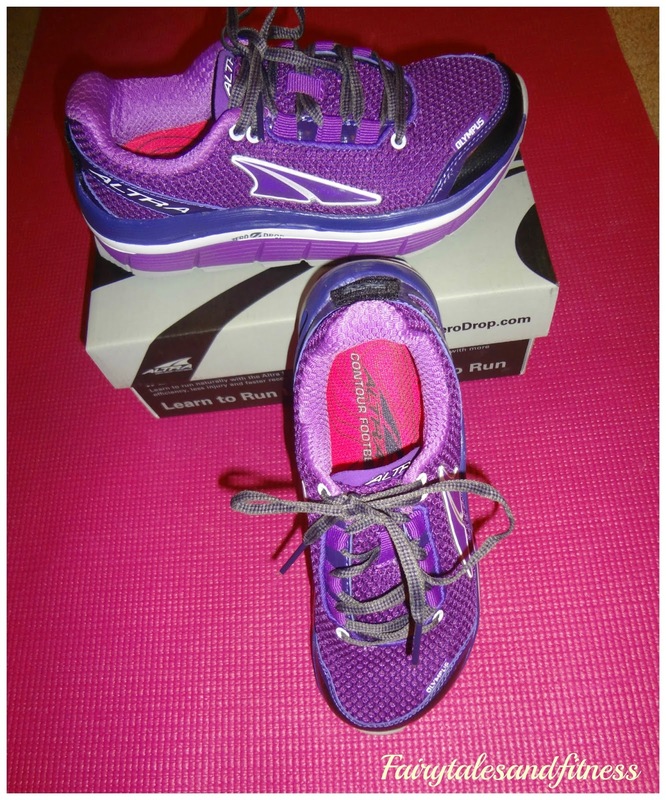 My Altra Intuitions 1.5 that I talked about earlier are also neutral but have "moderate" cushioning. Since I have been having major knee and hip pain ( yup it still hasn't gone away even though I am continuing to go to PT) I have really been picky with any new shoe I put on because I don't want something that is going to have a reverse effect on whatever progress I am making and I always fear that I am in the "wrong shoe". So of course I do lots of research and ask lots of questions. My main concern was with all this cushioning and did I really need it. This is what I found out. *Cushioning eases stress on your feet, but it can disrupt proper technique and increase joint impact. 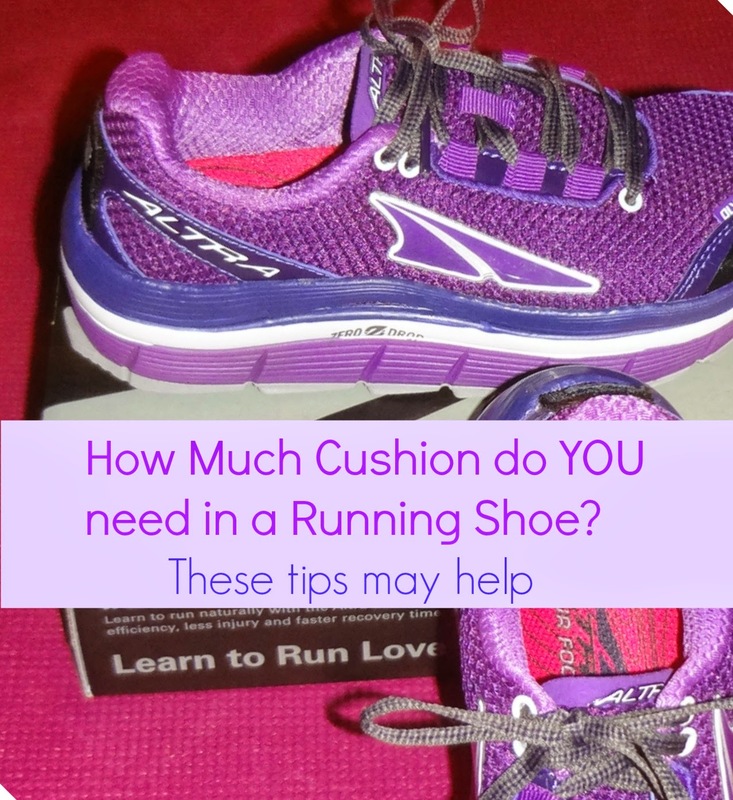 * Get a more cushioned shoe if you tend to have foot pain. * Get a less cushioned shoe if you have strong feet but tend to suffer from joint pain. Weight can also play a role in how much cushioning one may need. The heavier the runner, the more cushion they may want. Because I have never had foot pain ( knock on wood) but I have had joint pain, I am rethinking whether or not these shoes are a good fit for me. I really do like these shoes because they are comfy and lets face it they are cute. But I know that sometimes that's just not enough. 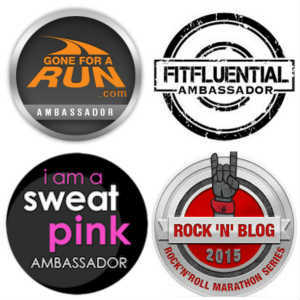 I 'm participating in a Running Shoe link up with our friends April and Patty. Go check out their posts to see what they have to say about their running shoes too! Is there anything else that I should be considering when choosing a pair of shoes? I received these Altras in exchange for a promotion I was a part of through our blog. I was not asked to write a review of them but I thought maybe other runners might have these same concerns so I wanted to put them out here. I couldn't think of too many words for the Disney theme this week that started with the letter "U" ( which was the theme) but then I remembered this picture from 2012. It was the afternoon after the Princess Half Marathon and our family ventured to Magic Kingdom. It had rained earlier that morning and there were chances of showers later on in the day. I decided to take an Umbrella into the park with us just in case. For some reason my sister and I thought it would be clever to put our umbrella up as we went down the final "Splash" on Splash Mountain! 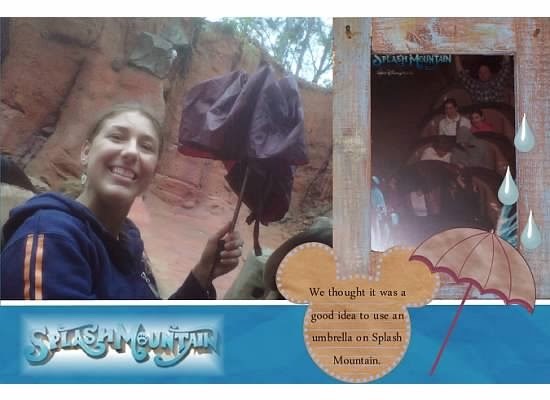 Afterall, we never actually had an umbrella on Splash mountain before.....lol ( Can you see it in the picture on the right?) Ok, so anyway looking back I know that was probably a dangerous thing to do and I'm surprised a cast member didn't say anything to us as we got off. Good thing this was a freebie umbrella because the force of the wind on the ride bent the frame and we couldn't use it again. We were glad it never did end up raining the rest of the day! What's your favorite "U" word memory from Disney? Have you ever done anything that could be considered dangerous on a ride? 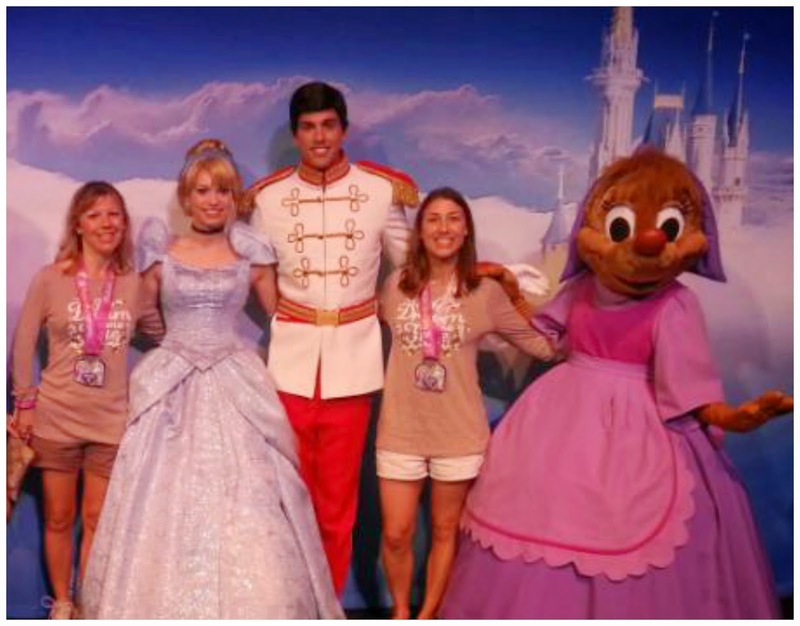 Thanks to Deb from Focused on the Magic for hosting the Wordless Wednesday Disney Blog Hop! 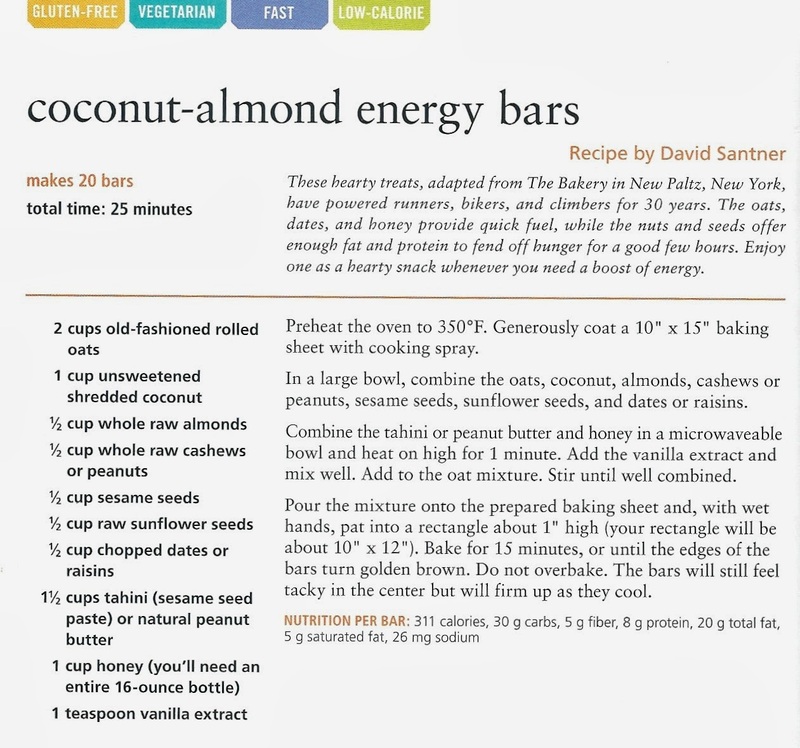 I wanted to start featuring more recipes from the Runner's World Cookbook and when I saw this one for the Coconut -Almond Energy bars I thought this might be a good one to make around Easter time. When I think of Easter goodies, I always think of Jelly beans, Peanut butter eggs, and stuff made with coconut! What foods do you think of when you think of Easter? 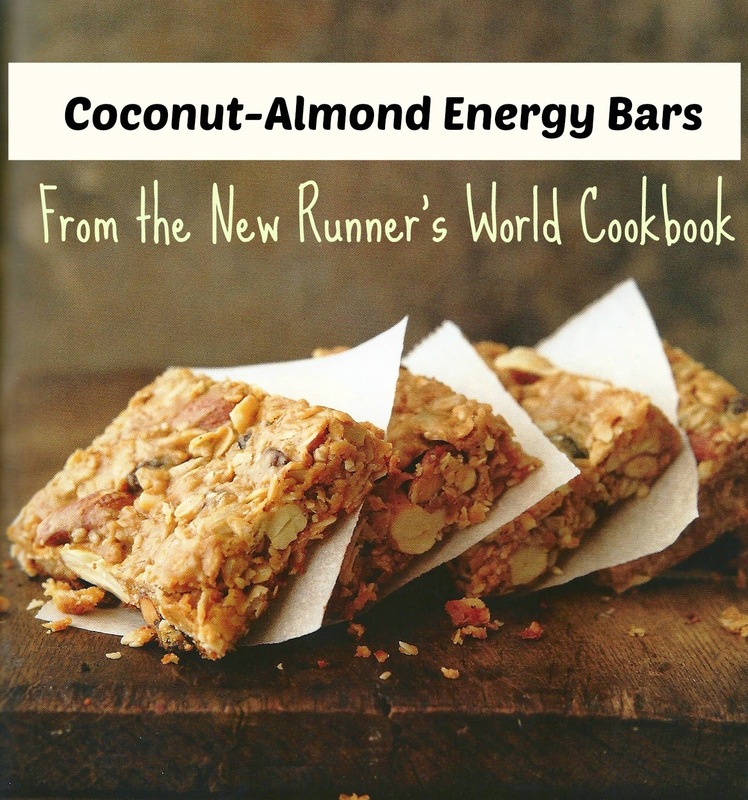 Interested in Purchasing the Runner's World Cookbook? You can buy it HERE. Thanks to everyone who gave very helpful comments on our blog yesterday. We appreciate it so much. 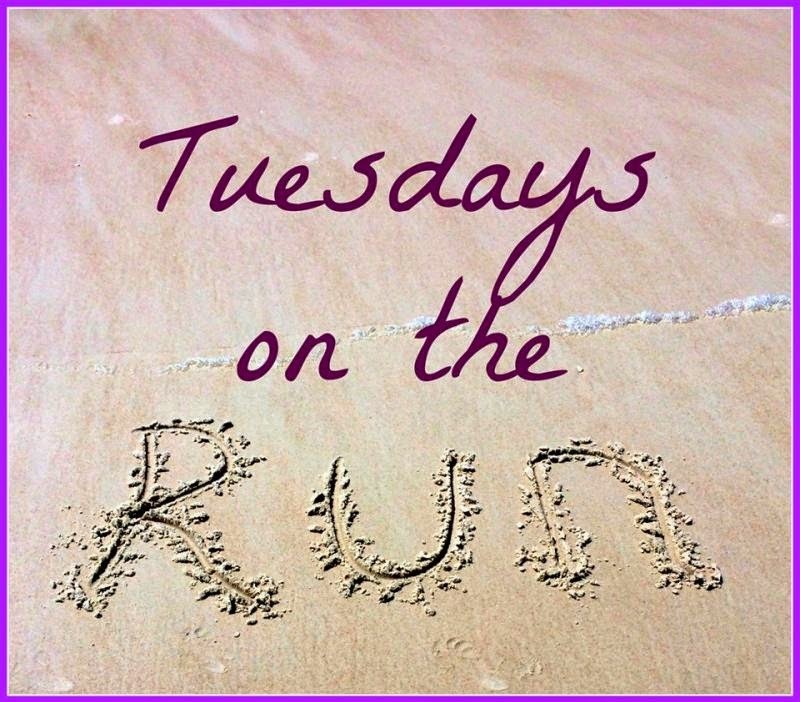 Don't forget to check out the other bloggers that linked up for Tasty Tuesday with us and Lean Lena! 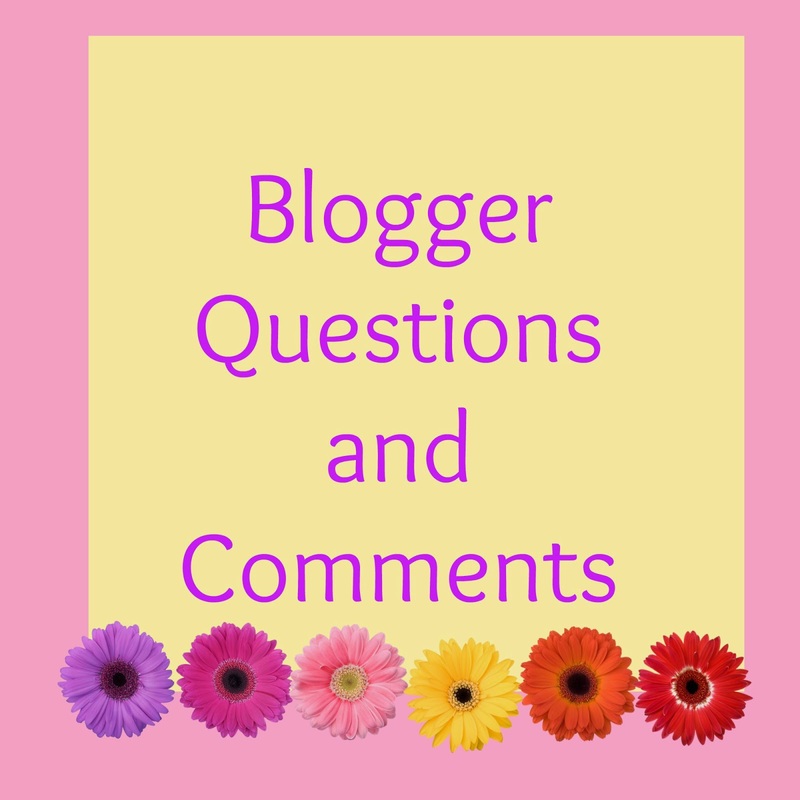 One year of Blogging Questions and Comments: Who Can Help? Today will be one year since we started our blog but instead of gushing about how it is our "blogiversary" as you would call it in the blogosphere, we are going to come clean and lay out all our comments and questions that we have about blogging and social media because sometimes we still feel so lost! We blog because of the relationships we are building (online and offline) but it does take commitment and lots of work/time. We try to connect with people who have similar interest as us, who are always encouraging others, and who want to try to build connections with other runners as well. So after a year of blogging we are doing some Spring Cleaning: Which consists of the following. * After a year of consistently reading and commenting on other blogs, if those bloggers have never taken the time to respond to our comments or even pay a visit to our page, then these blogs will be removed from our reading list or no longer be visited by us. This gives us more time to spend on the blogs that are interacting with us. Besides, isn't that why we blog, to interact with people. It can't all be one sided. * Over the past few months We've become involved in more blogging groups and have discovered lots of fun new blogs. We've been reading them now and then through the group, but are excited to make them part of our (hopefully daily) reading list! * We like to visit everyone who's visited our page. The problem is that some people are hard to find. Clicking on your name doesn't always take us to your blog. We might end up on some other type of profile. Because of these reasons we may not realize that you have a blog. So PLEASE, if you are leaving comments on our blog and we are not visiting yours leave us your blog address in the comment. Thanks! Which I guess brings us to our next question. * Do you find Google Plus to be helpful? From what little bit I read, it makes it seem as though when you search for something, the first results that are brought up are from the people in your circles. Personally I would think you would want to search what else is out there in an effort to find "new" material, not material you've already read on someone's blog that you already follow. I don't know about Google Plus though so I could totally be missing the point here. * Another commenting question. How come on some blogs we have to log in with our Twitter account instead of our blog account? *Why are bloggers still using CAPTCHA? Do you know you can turn that off and still control your Spam messages? I'm just putting that out there because when we first started blogging, we had no idea that CAPTCHA was on and that our readers had to go through that to leave a comment. ( CAPTCHA is the set of numbers or letters that you have to type in the box in order to leave a blog comment). I can never get the letters right so I always refresh it until I get a set of numbers! *Why do bloggers get so bent out of shape when other bloggers do Sponsored Posts? I have read the irate comments on this topic on blogs over and over again and I don't get it. I for one don't mind. It usually introduces me to a product that I would have never known about and they usually end up being pretty good gift ideas or foods that I'd want to try. * (This is a for real question and not meant to be snarky) Why do people need both Instagram and Twitter? Why can't they just post their picture on Twitter instead of posting a link on Twitter to see their picture on Instagram? * We read other blogs through our reading list on Blogger. The problem is that sometimes some of your blogs are missing or it tells us we have no blogs on our list. Sometimes it hides certain blogs and calls them our "secret" blogs. I don't know what this is all about but if we've been missing your blog lately, sorry. Anyone else have this problem? * Do readers really want to learn more about "US"? We have always tried to keep our blog content topic focused here on Fairytales and Fitness but some recent blogs about blogging have said that readers want to know more about "YOU the blogger". Is this true? What would you like us to write about? With this being said, we want to thank everyone that has been so kind to read what we've written over the year. Thank you all for your encouraging words, for celebrating our PR's, and for your best advice on our injuries. We can say we've made some pretty cool friends through this blog ( both online and off)! Your Turn! Can you answer any of our question today? Don't forget tomorrow is Tasty Tuesday! Do you have a food post to link up? We have been blessed to be a part of a very active family. So when the gals from the DC Trifecta blog hop suggested Family as the theme, I thought this would be a great time to share a little bit about mine. 1. 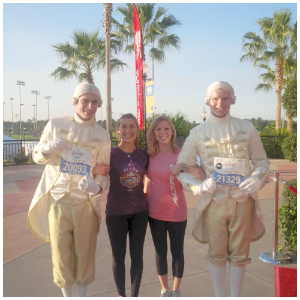 Our family races have always consisted of running at Disney. 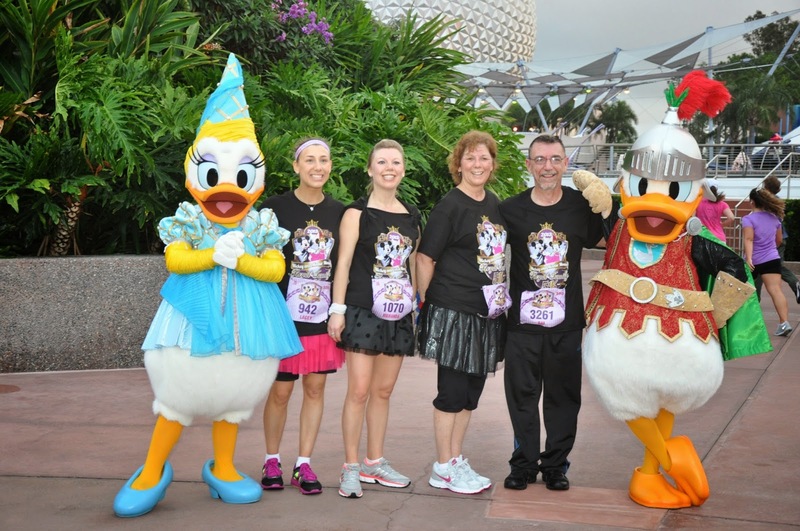 To date, Disney races are the only race where all four of us have run together. 2. I've been lucky enough to do several races with just my dad. The very first race that we ran together he placed first in his age group! I was so proud of him! 3. I've also done several races with just my mom. We really help push and encourage each other along the course! 4. I've done one race with my mom and my dad together. Although we did not stick together during the entire race, we all crossed the finish line closely together and had a great celebration afterwards. 5. 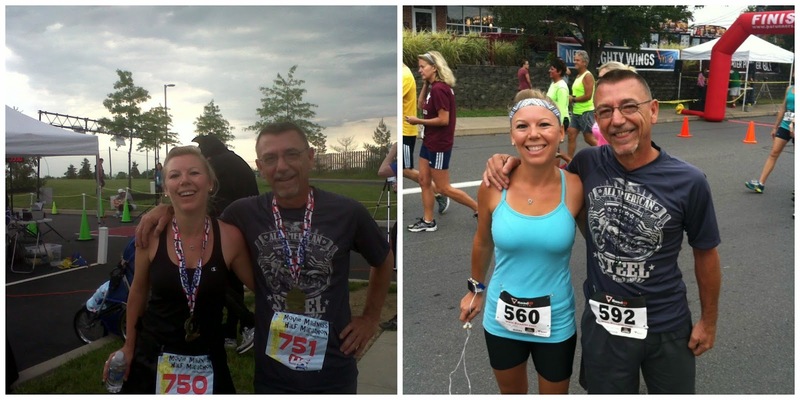 Although my sister and I have run many of the same races, we rarely run them together at the same pace. This race was an exception. We ran side by side the whole time! 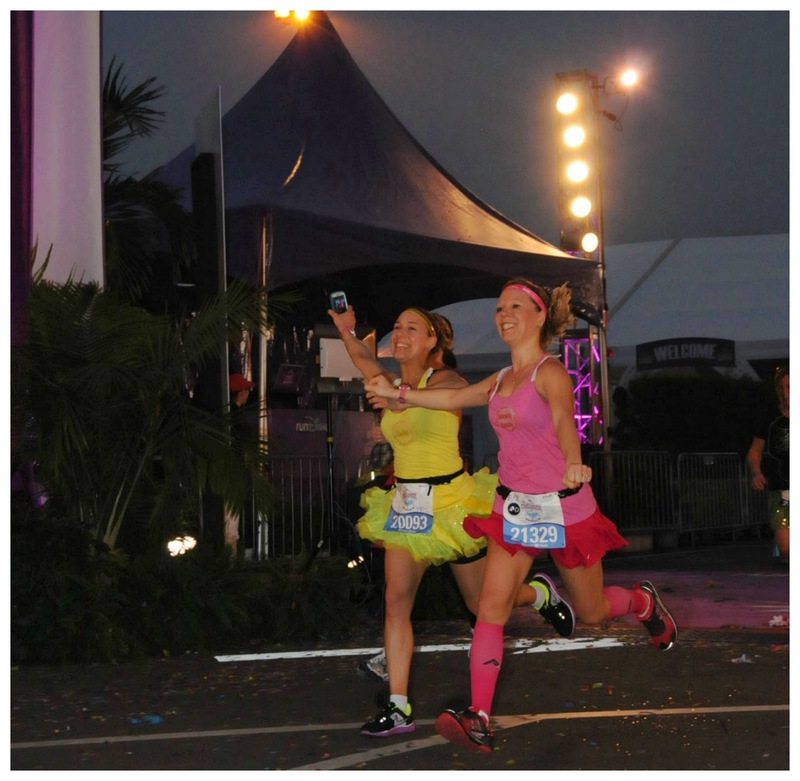 Running with my sister is very special and we have many more races we've plan to run side by side in the future. So far these have been my favorite people to run with. However, I have a few races planned this year with some other very special folks and I am very excited about that! I can't wait to add some others to our family of runners! Who do you run with? 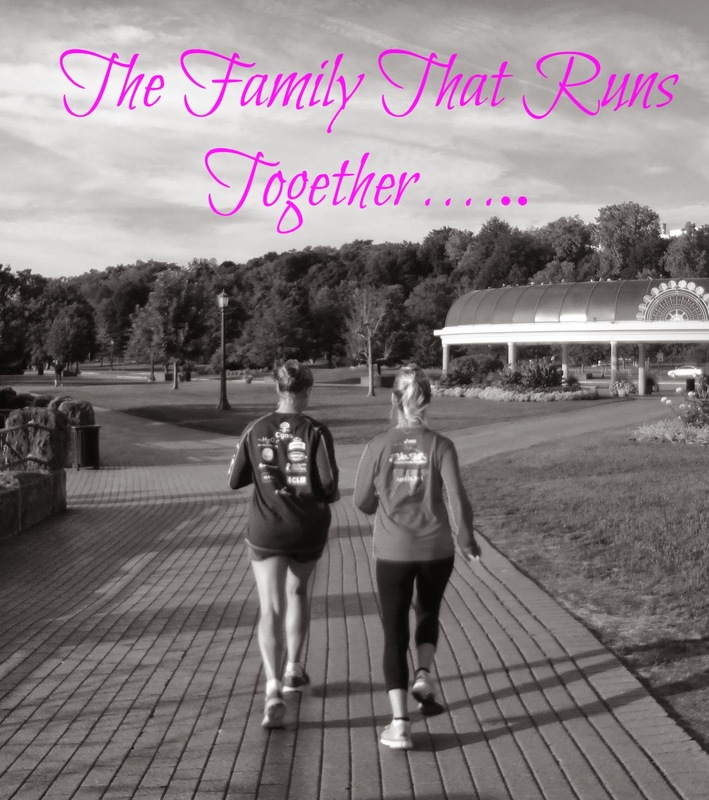 Do you do races with your family too? Please visit us again on Monday as we have a post that we will need YOU to be a part of! Thanks to Courtney, Mar, and Cynthia for hosting the Friday Five. Make sure to check them out! I started race weekend off by arriving at the expo to pick up my packet and while I was there I got a few goodies. A sweatshirt, magnet, and some stickers. I met up with my friend Christine and we listened to Bart Yasso speak about his many adventures he's been on throughout his running career. I then went over to the booth to meet the pacers. Luckily the one I wanted to speak to was there. The 3:45 pacer. I knew I probably wouldn't be with them but I was hoping to finish before the 3:55 pacer which was the next option. I never ran with a pacer but I thought to myself what do I have to lose. So my goal was to keep the 3:45 pacer within my distance and not let the 3:55 pacer pass me. 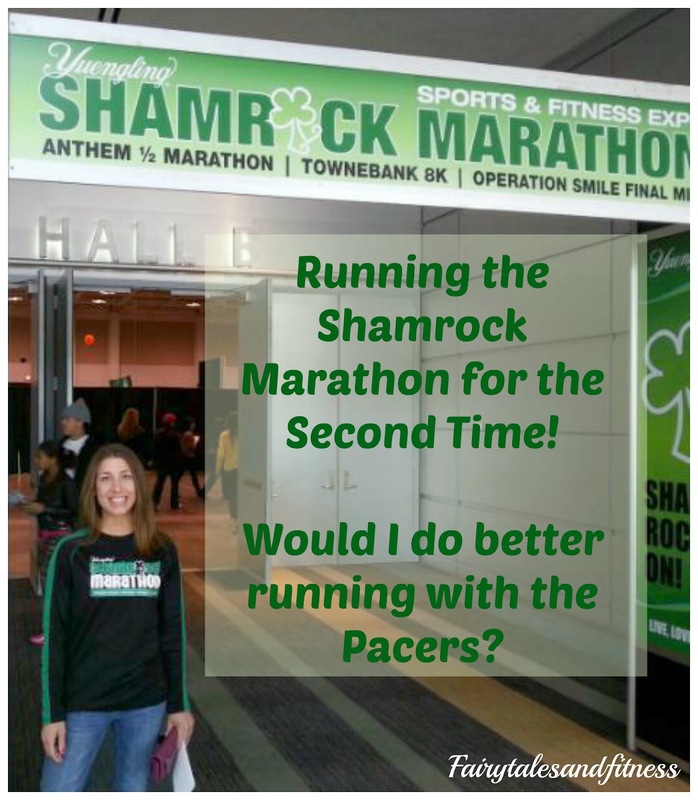 I talked to the pacer about water stops and bathroom breaks (because one race I saw a pacer do that) and he assured me that there would be NO water stops and NO bathroom breaks! Which just confirmed that I was going to bring my own water bottle (which I was contemplating earlier in the day). Later Christine from We Run Disney and I met up with a few more blogger, Beachy Runner, and This mamma runs for cupcakes. Then it was time for a pasta dinner to carb up and then to make sure I had everything I needed set out for race day! I woke up on race morning feeling good. I told myself that I was not going to stress about the race. 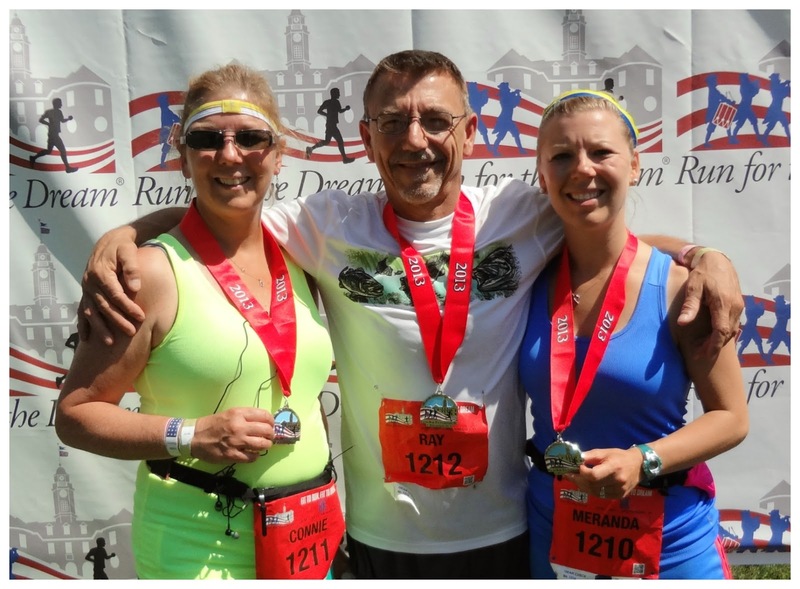 It just seemed so long ago since I ran my last marathon (May 2013). I knew that I was not as trained as I was last year for this race, but I still had a goal in mine that I was hoping to get. I had my outfit picked out a few days ago, regardless of the weather (because every day it would change). 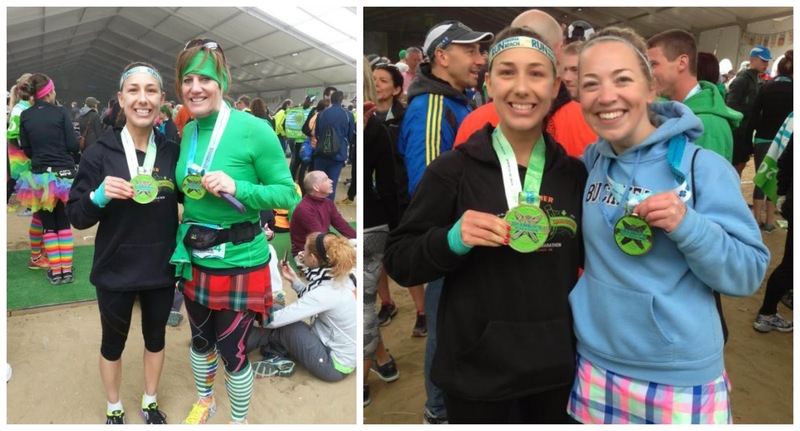 I wanted to wear green because it was a Shamrock race, so I decided to wear my teal arm sleeves from Running Skirts with a matching tank top and capri pants. This is the closest variation of green I had! Since I was wearing my arm sleeves I was able to keep some of my GUs in them, and the rest in my water bottle pouch. This was another nice bonus, so I didn't have to wear my belt. After I got dressed in the morning I went outside and jogged around a bit. I saw the sun coming out, so I was pretty happy with the outfit I decided on. I chose arm sleeves since you could roll them down or roll them back up. I did think that my shoulders may be a little chilly, but thought after warming up a few miles I wouldn't mind. I didn't even need to wear gloves since my arms sleeves wrapped around my hands. 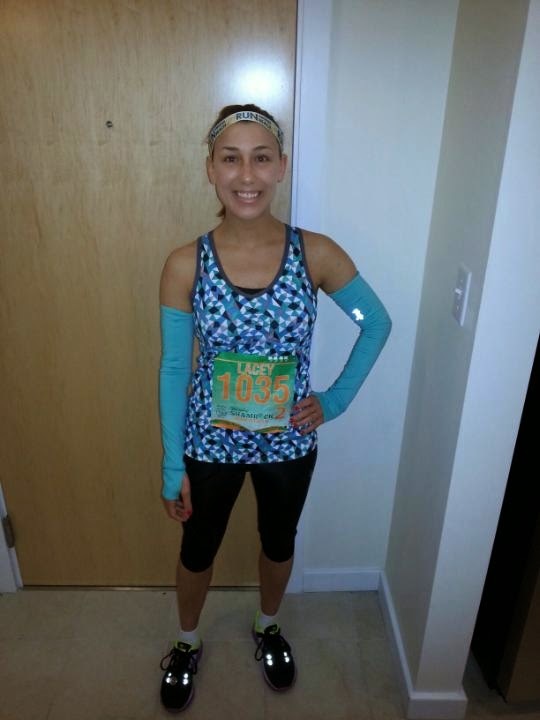 I did decide on wearing my head warmer, and I'm so glad I did, because it was very windy throughout the race. Now I know I've said this before but I'm going to say it again. As much fun destinations races can be, you cannot beat doing a race in the town you live in. I literally crossed the street and was at the starting line. I got in my corral, found my gps signal, and listen to the national anthem, and then it was time to start. I did start behind the 3:45 pacer. I didn't feel the need to be right beside him since I listen to my ipod anyways and wouldn't be able to hear a word he was saying. I started feeling good. I told myself I wasn't going to keep an eye on my gps if I could still see the pacer ahead of me. I got to about mile six feeling really good, like I could have passed him but knew there was a long road ahead of me so I chose to stay back. By about mile ten I did lose the pacer which was fine, because no other pacer passed me. That's when we made our turn on the boardwalk and that's when the wind really started to pick up. I thought maybe I could find a taller guy to run behind. Well of course there was no one passing me at the time, and the group ahead of me was too far up. So I did slow up a bit hoping someone would pass me. Luckily two taller guys started running in front of me so I ran up right behind them so they could block the wind for me. I wonder if they knew what I was doing. I was so close to them that I could have gotten elbowed. I was trying so hard to keep up with their pace. I did the rest of the boardwalk until we made the turn off and got close to mile 13. It was then when one of the guys had to make a pit stop. There goes that idea! I knew after crossing the halfway mark I would not get the time I did last year since I was already behind by a few minutes, however, I felt I was still keeping a good pace. I saw one of the guys in my running group cheering on the sidelines and he recognized me, which gave me a little more motivation. At about mile 15, I looked at my watch it said 2:10, and I was still going strong. I looked on the other side of the road, which was the 23 mile marker, and saw a few "elite" runners that were practically sprinting! I thought it'd be nice to be on that side. I knew from last year that the next several miles were going to be pretty boring running down Shore Drive, although there were a few spectators and a band along the way. Heading into Fort Story it became very windy. I began thinking to myself I wish I had my gloves and a long sleeve shirt. Or maybe one of those cape things that only cover your shoulders, which looked so goofy when I saw them at expos, but thought it'd come in handy at this moment. So needless to say, that sun I saw in the morning, never ended coming fully out, instead it became overcast and very windy! Well I've already completed 20 miles at this time, I could easily do the last 6.2. And that's just what I did! I remember crossing the 23 miler marker and looking across the street thinking to myself, I'm so glad I'm not at mile 15 now! After getting to mile 24, I changed my gps from distance to minutes per mile to make sure I was within my pace range. Once I hit the boardwalk I knew I was on the home stretch. It wasn't until I passed the 26 mile marker that I gave it all I had and sprinted across the finish line! Even though I felt not as trained as I should be, I was only three minutes slower than last year, which I was proud of. After I crossed the finish line I had my friend meet me with my sweatshirt and phone, then I headed to the tent for my tasty stew and listened to the entertainment. We were even offered several Yuengling beers after finishing (but I'm not much of a beer drinker so I didn't have any). 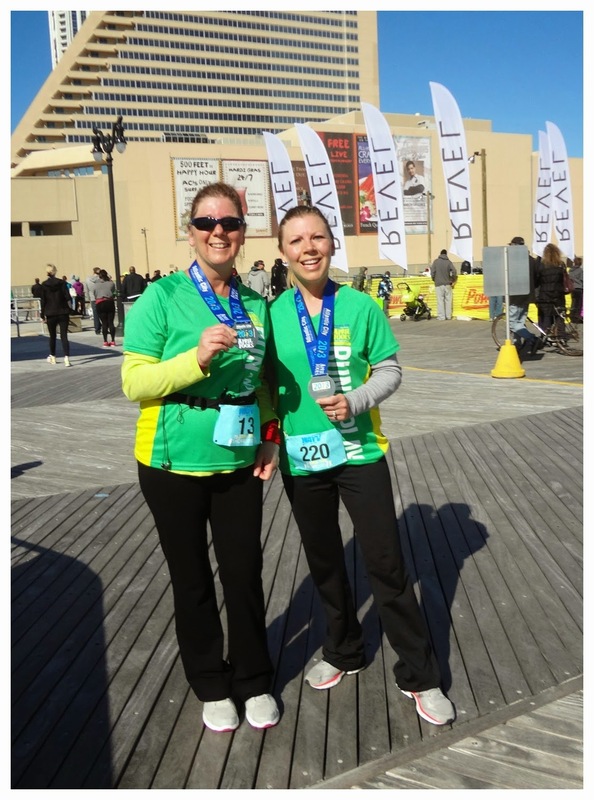 I was able to find my friends Jane and Christine that were celebrating earlier after completing the half. Congrats Christine for a PR! I left shortly after because it was just too cold. I thought a hot shower sounded more appealing than a cold beer. What are your thoughts on running with a pacer? Do you use them? 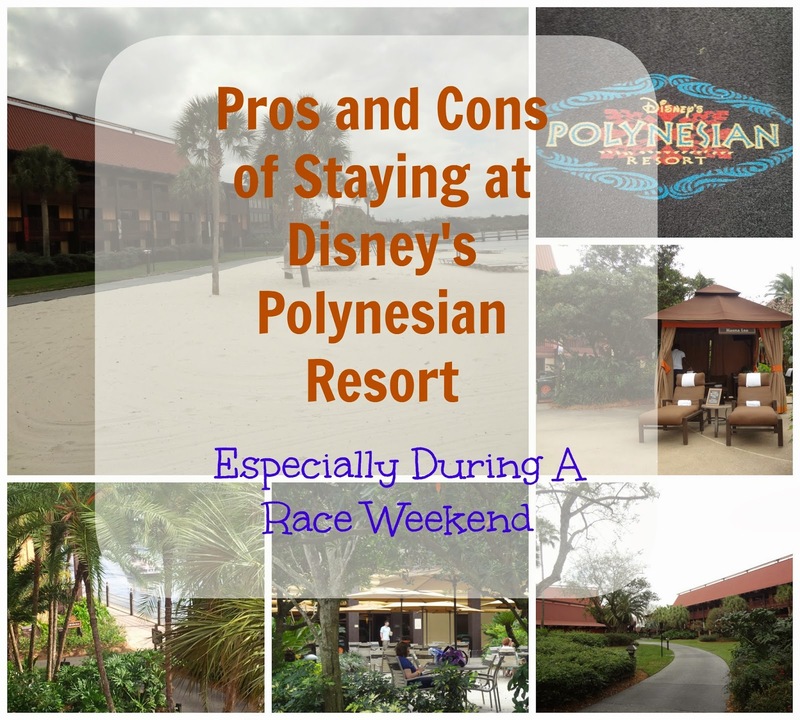 The Polynesian Resort: To Stay or Not to Stay During a Race Weekend? 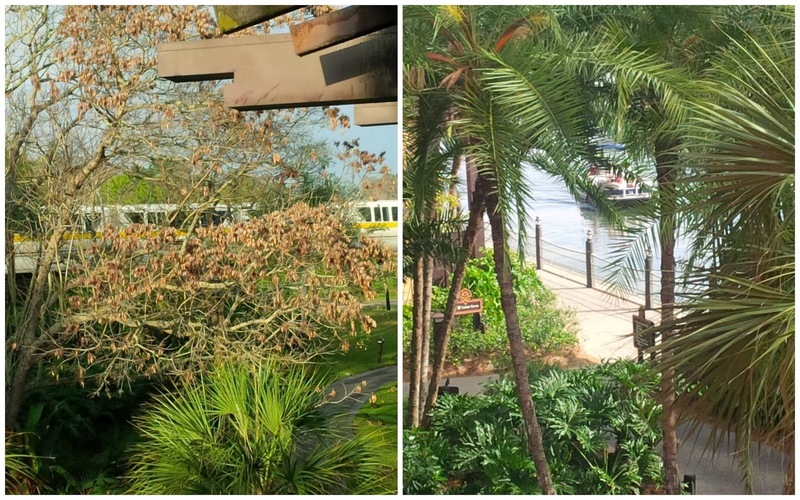 The Polynesian Resort has some of the most picturesque landscaping so I thought this post was appropriate for Deb's link up today. The decision of what resort to stay at while visiting Disney is such a personal one that depends on many factors. We have stayed at all levels of Disney resorts from the All-Stars, Moderates, Villas, and Deluxe, and quite honestly we were happy at all of them. When we visit Disney for race weekends, we look for different things in our resort than if we were visiting for a full on family vacation or a quick sisters trip. So far, we've found that we prefer to stay at the Polynesian for race weekends. 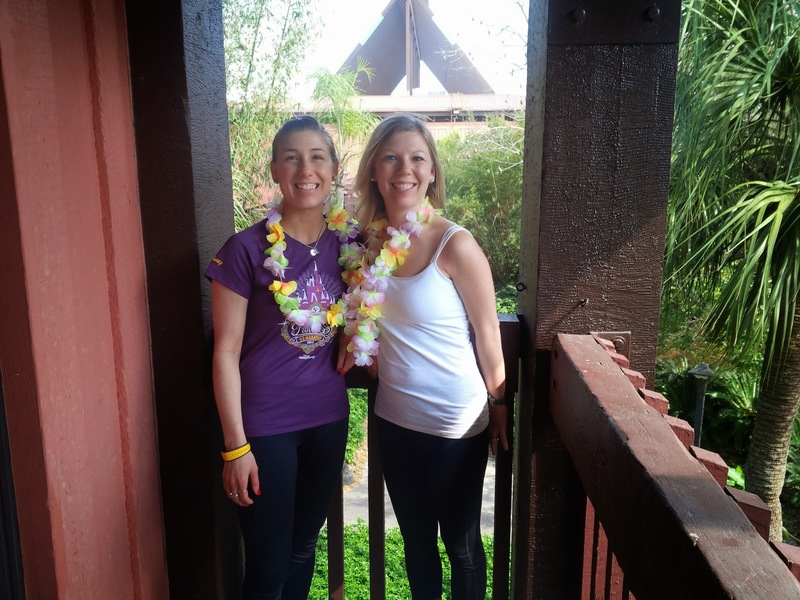 If you should choose to stay at the Polynesian resort for your next stay during a run Disney race, here are a few pros and cons you might want to consider. Although the concierge says that all the rooms are the same, they really aren't. We were moved a few times ( due to no fault of our own) and we noticed that some rooms had larger ( and a bit nicer) bathrooms, and some rooms had walk out balconies, and some rooms only had large windows. I'm not sure if they slid open, but you couldn't walk out on a balcony. We were lucky enough to get a corner room with a great view. Almost any view at the Polynesian is great, unless you get a view of the construction. We could see across the lake on one side, and the monorail in front of us. Yes, some rooms are in front of the monorail. Yes, you could hear it go by but it didn't bother us one bit. It was kind of exciting and we liked seeing it as we sat out on the balcony. If you think this would bother you than you might want to ask for a room away from the monorail. Having the monorail for easy transportation was a big reason why we chose to stay here, but the fact that it was shut down from 11 am- 7pm was a bit of a bummer. The monorail does run in the wee hours of the morning for race day transportation between the Polynesian, Grand Floridian, and Contemporary resorts but you still have to switch monorails at the Transportation and Ticket Center and grab the one that goes to Epcot. Since we were staying at the Polynesian we found it easier to just walk to the TTC and get on the Epcot monorail. The walk is not far at all and it saved us time by not having to travel to all the other MK resort. This was probably the biggest benefit to staying here on race weekend. The larger rooms are also a benefit when you are sharing a space with other runners. 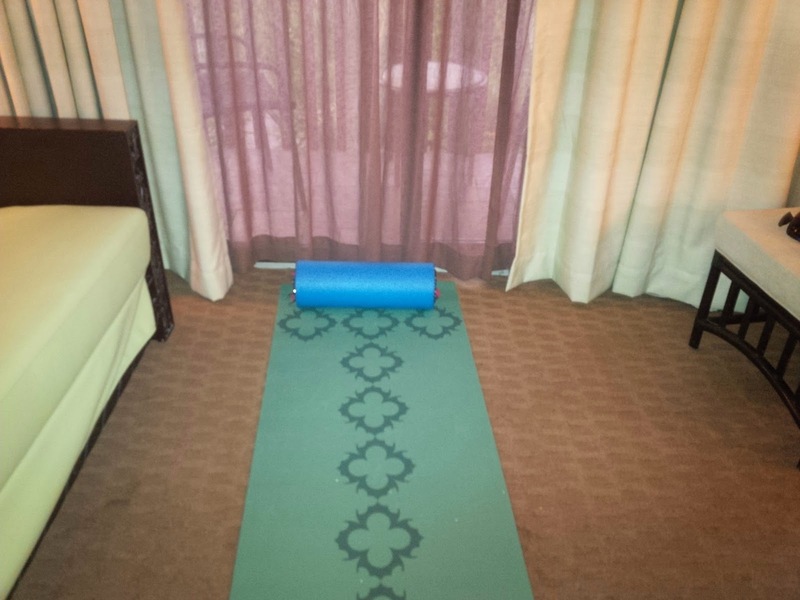 We all had enough room for all our things and I even had room to lay out my yoga mat and foam roller! We don't expect to get lots of park time in during race weekends, but we do expect to relax a lot at the resort and realistically, sleep is pretty important to us. Having the comfy beds and the inside corridors that cut down on some noise was pretty important to us. Oh, and it helped a LOT that the ice machine was right outside our door. How perfect was that? Our staff at the Polynesian made our stay a little more magical too! 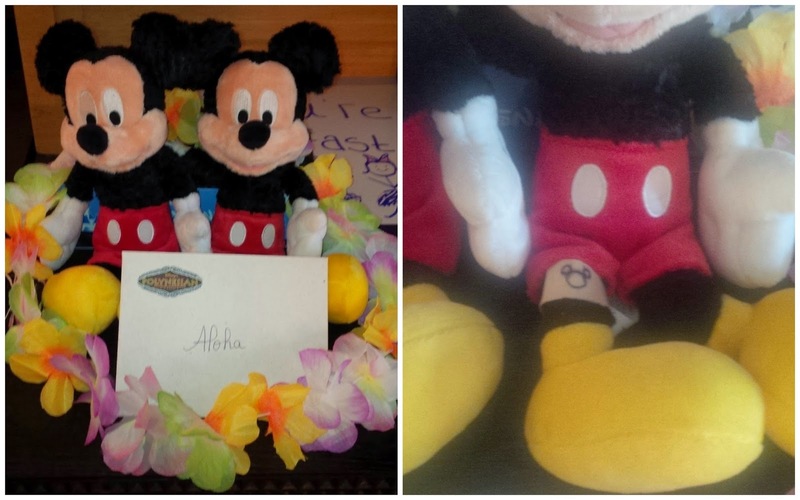 After our last race, these Mickey's were left on the dresser with a very nice note from our housekeeping staff. She had met my mom in the hallway several times over the weekend as my mom was getting ice for my leg. Look at the bandage on Mickey's leg. I thought that was so sweet. One of the other things that we like about staying at the Polynesian is the variety of food choices. Ohana, Kona Café, and Captain Cooks are all our favorites! It doesn't hurt that you can see Wishes right from the resort too. I think we only stayed up late enough to see them only once though! What resort do you like to stay at during a race weekend? 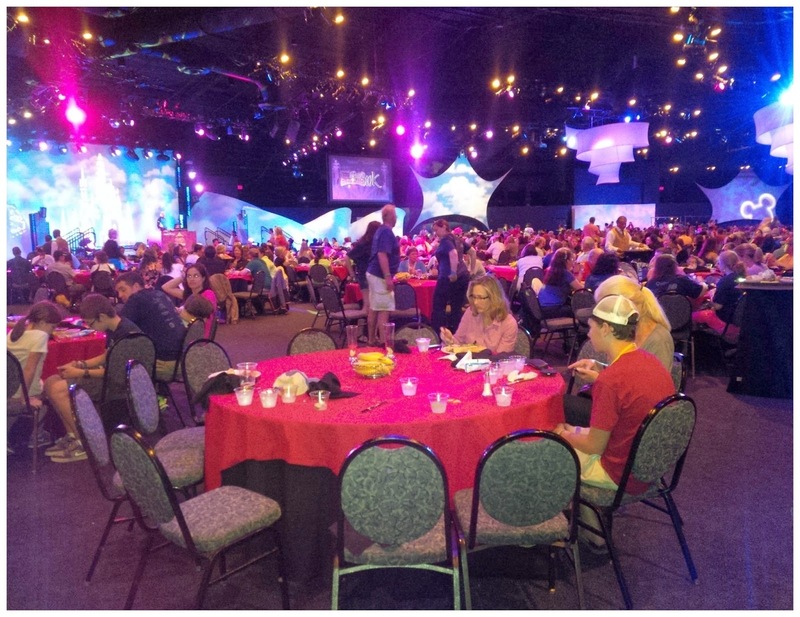 Is your choice of resort different when you are visiting Disney for a family trip other than a race? It's no secret that I love to cook. It's even extra fun when it's for a holiday when I can make a "themed" meal. ST. Patrick's day is not really a holiday that we celebrate at our house, we don't wear green and we don't drink green beer. I don't even own any shamrocks or St. Patty' day decorations. When I took my Valentines decorations down last week ( I know I'm a little late), I put my spring/Easter decorations up right away! 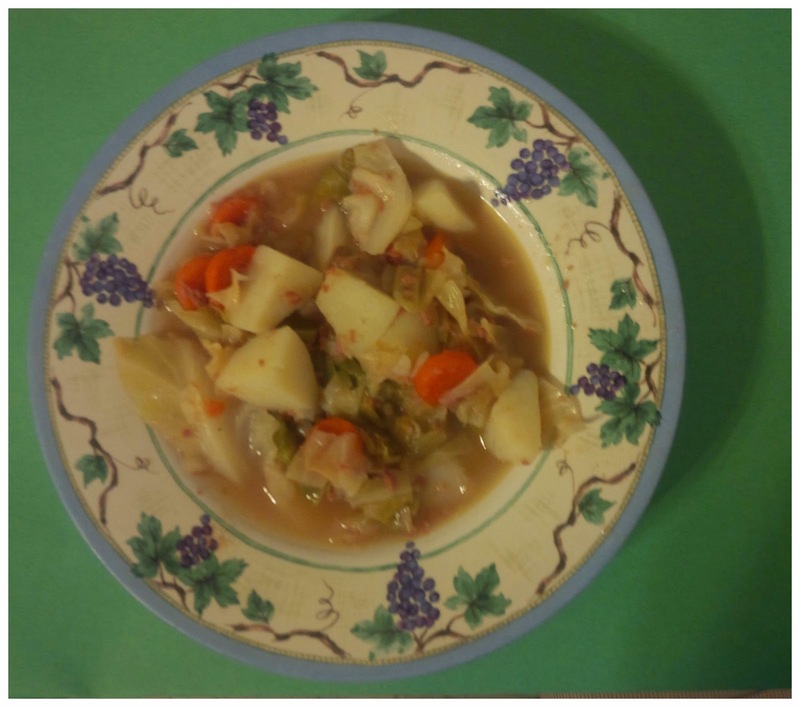 But I did use the day as an excuse to make the Irish meal Corned Beef and Cabbage. Look through any recipe website and you will see this dish made several different ways. My sister and I have both been to Ireland and yet we have yet to taste this dish prepared the traditional Irish way! Our way is more of a stew/soup. 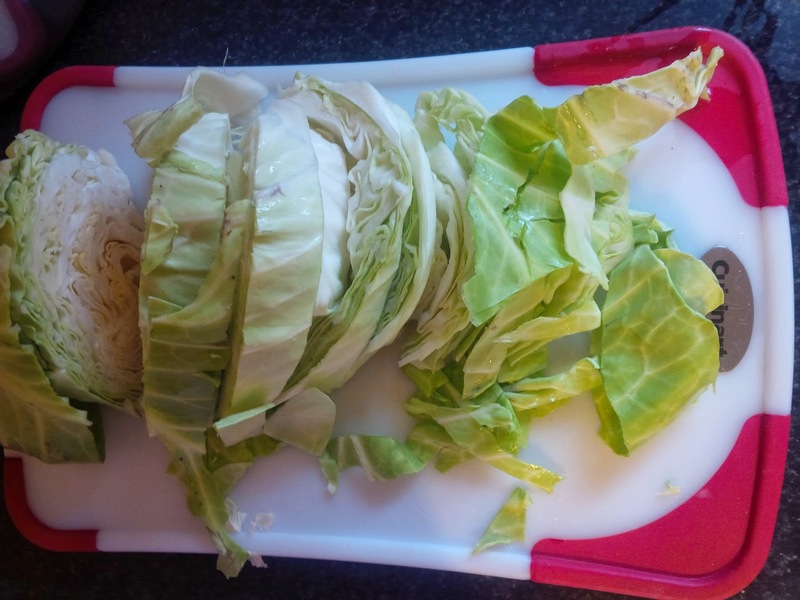 Rinse and cut up cabbage into chunks. Put cabbage and potatoes into a large pot. Fill pot with water ( do not fill to top) but in bouillon cubs, cover with lid and let cook. If you are using fresh carrots you can put them in the pot at the same time as the cabbage and potatoes. 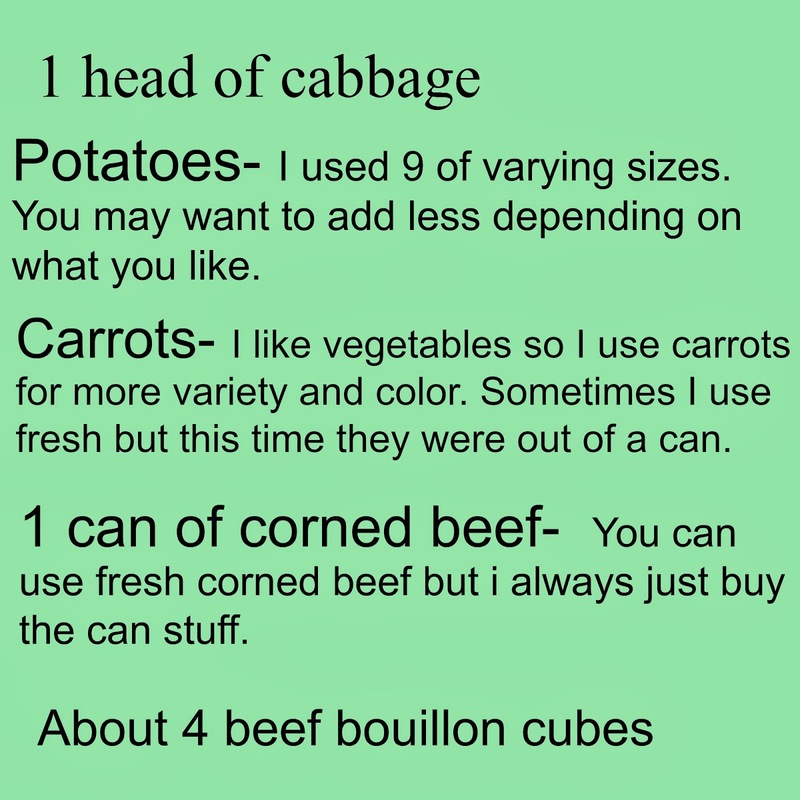 If you are using canned ones like I did then wait till your cabbage and potatoes are almost soft. Putting your canned carrots in too early will make them mushy. Add corned beef. 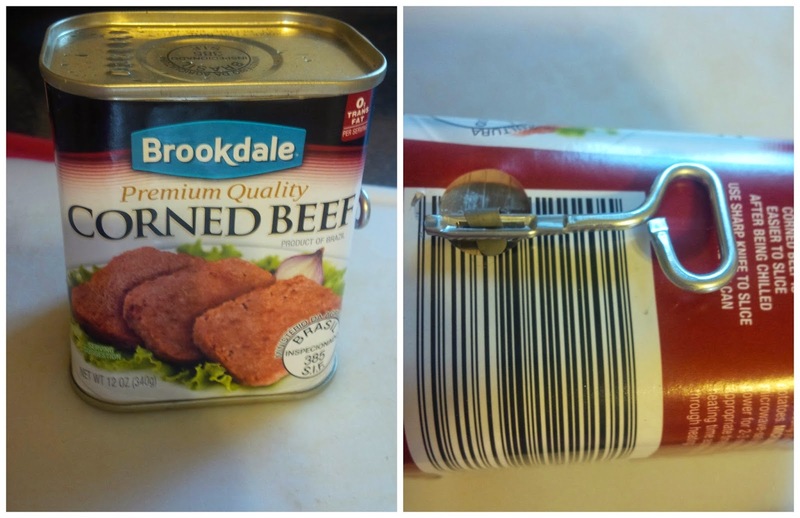 Opening these kind of cans can sometimes be tricky. Remember to take this fancy key off and flip it around to open the can. Let all simmer for 25-30 minutes. And the finished product was a success! I know the sound of corned beef may turn some people off, but it truly is a yummy meal filled with many nutrients. Honestly this is the only way I've ever eaten corned beef. I'm actually considering trying Ruben sandwich next time I go to a restaurant that serves them. 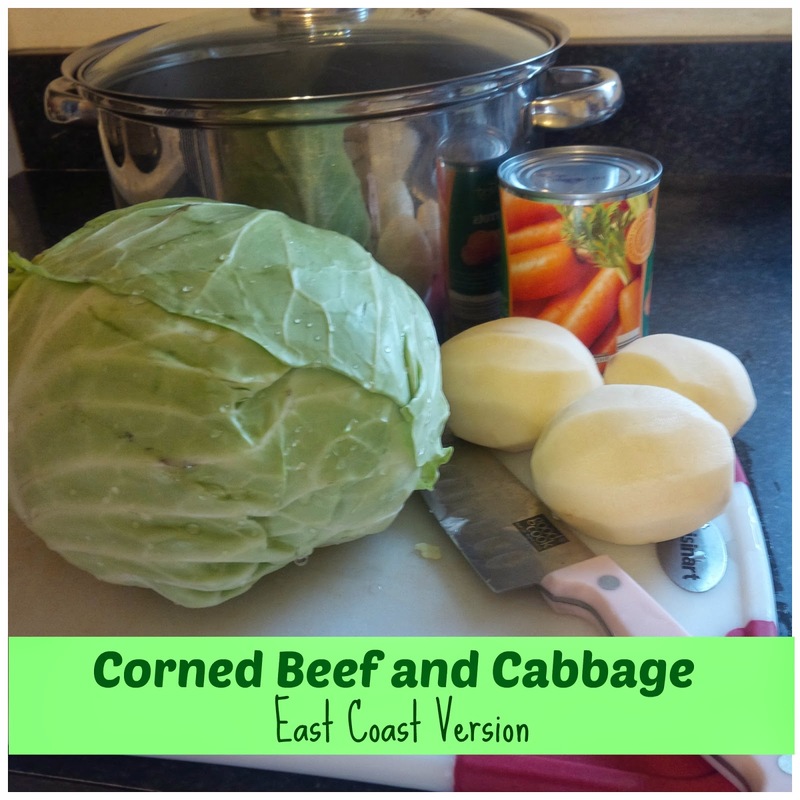 Have you ever had Corned Beef and Cabbage? If so, how was it made? Do you enjoy Ruben Sandwiches? Feel free to link up your food posts with us and Lean Lena every Tuesday for the Tasty Tuesday Link Up but please don't link and leave. Make sure to visit the other bloggers who participate as well. Thanks! We can't wait to see what yummy things you have to share!